: Colorless to a pale olive yellow viscous liquid. with Characteristic woody balsamic-like odor. 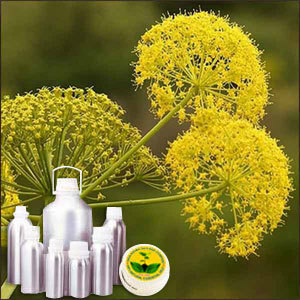 Galbanum Therapeutic Grade Oil is pale yellow to yellowish brown clear liquid that is extracted through steam distillation from resin ducts of the plant. Galbanum is a large perennial herb having smooth stem shiny leaflets with small flowers. It contains resin ducts that exude a milky juice, a natural oleoresin. This oil was traditionally used for medicinal as well as spiritual purposes. A top note with a medium aroma, this oil possesses an intensely fresh, green leafy odor with a dry, bark-like back note. Galbanum Therapeutic Grade Essential Oil. Galbanum Therapeutic Grade Oil is said to have anti-spasmodic, antiseptic & body-supporting properties and is considered as an intermediate between Ammoniac and Asafoetida to be used for relieving air passages. Galbanum Therapeutic Grade Oil recommended due to its various therapeutic properties which include - analgesic, antiseptic, antispasmodic, anti-neuralgic, anti-infectious, carminative, disinfectant, insecticide, stimulant and tonic.